I hope your Thanksgiving was a fun, relaxing, fulfilling and memorable day filled with food and family. Today is Black Friday and many of you might be out hitting the stores, scoring deals on gifts and stocking stuffers. 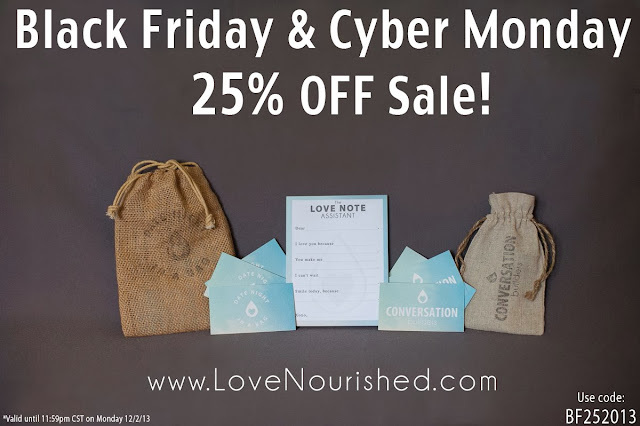 To join in on the fun, Love Nourished is having a Black Friday, Small Business Saturday and Cyber Monday Sale this weekend. That's right, ALL weekend, until 11:59pm Monday night, you can save 25% off all items from Love Nourished! Use the coupon code: BF252013 at checkout to save 25% off your total purchase! All three Love Nourished products make great gifts and stocking stuffers. Plus, like always, every item purchased gives 5 years of clean drinking water to someone in need. Not only are you giving a gift that will help nourish the relationships of those you give it to, but you are helping someone else receive live-giving water as well. Holiday giving, taken to a whole new level. Visit www.lovenourished.com to learn more about our feature products: Date Night in a Bag, The Love Note Assistant and Conversation Builders.